Doosan’s range of electric three wheel trucks have a reputation for quiet efficiency. One customer, Hilding Anders, the name behind Dunlopillo, Myer’s, Staples and Slumberland, knows more than most about comfort and quality. 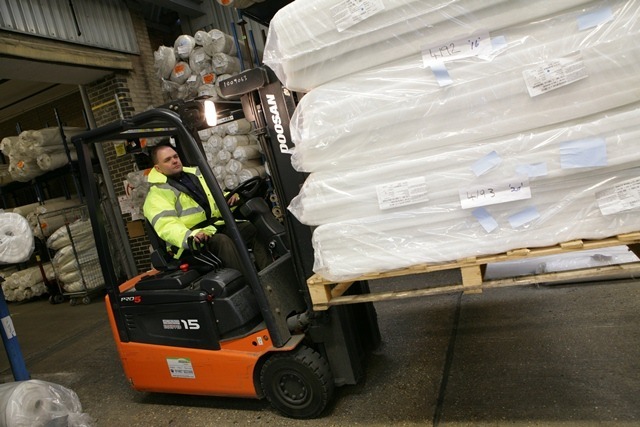 A fleet of new Doosan electric and diesel forklifts are now bringing greater productivity and efficiency to the company’s mattress production site in Huntingdon. From snug beginnings to king-size comforts, generations have enjoyed a restful night’s sleep on a Hilding Anders mattress. Founded by Horatio Myer in 1876, Myer’s bounced to life in a small factory in London, employing just 19 people. With a focus on hard work and crafting great products, the company was slowly built into a market leader within the UK bed industry. As the company grew and expanded, so did their reputation for providing high quality products at great prices. 2007 marked a huge turning point for the company as they became part of bed giant Hilding Anders Group, a leading manufacturer of beds and mattresses in Europe, Russia and Asia with an annual turnover of £6.7 billion. “In this business, it is imperative to have highly efficient forklifts. We are constantly shipping goods in and out of our factory. If a forklift fails or become faulty, it could result in slow delivery times and potential damage to products,” said Hilding Anders’ operational director, Michael Kent. “It’s our reputation for high quality and consistency that keeps our customers coming back, and we cannot afford to lose it.” From the machines they use to the staff they employ, Hilding Anders need the best if they want to stay at the top of their game. This also applies to the material handling equipment used throughout their large warehouse. Building rugged, reliable, yet simple trucks, has allowed Doosan to become a leading provider of forklift trucks in the UK. By adding high specification features, and proven technology, our aim is to increase productivity whilst lowering equipment lifetime costs. The complete electric range features AC Powered motors to meet modern day traction requirements, and come with advanced AC controllers which provider greater levels of productivity, control and flexibility. The B15T-5 electric forklifts, now in operation, is typical of Doosan’s product ethos of simple versatility and value for money. Productive and manoeuvrable, the electrics offer the latest Active Control Technology and Operator Sensing for added safety and performance. According to Paul Watson, Doosan’s UK General Sales Manager, consistency, reliability and ease of use were the primary reasons the Doosan was recommended for the application. “First and foremost, Hilding. Anders needed a first-rate truck that could do the job with the best possible quality,” said Paul. Joining the electric trucks are a number of Doosan 4.0 tonnes diesel trucks are also in operation, working outside in the dispatch area, completing the picture and giving Hilding Anders everything they need to ensure future orders can be dealt with promptly and efficiently. In addition to being pleased with the Doosan forklifts, Hilding Anders is also happy with the service received, so it’s not just their customers that get a good night’s sleep. “We need to be able to count our suppliers, and I have to say the support and service we have received is outstanding,” said Michael Kent. Horatio Myer & Co Ltd is a subsidiary of Hilding Anders which was founded in 1939 in Bjärnum, Sweden. The company has since grown considerably and is today the leading bed and mattress manufacturer in Europe and Asia. The main office is located in Malmö, Sweden and the Group is owned by the British investment company Arle Capital Partners Limited. In 1962 the Huntingdon site was opened, employing 70 people and producing 750 bed sets a week.